An immigrant from India, I arrived in Canada in May 1968. Canada is my chosen home. It is not perfect. No country is. But it is more perfect than most. For me, Canada 150 is about making Canada, in the years ahead, an even more perfect confederation - a more just, egalitarian, prosperous and inclusive society. 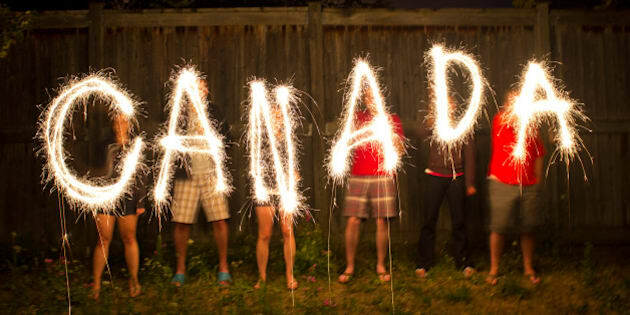 The word Canada in sparklers in time lapse photography as part of Canada Day (July 1) celebration. I celebrate the Canada of 2017 for opening its doors and promise to millions like me. An immigrant from India, I arrived in Canada in May 1968. Just the previous year Canada had celebrated its Centennial, capped by Expo '67. I had been in the United Kingdom for over three years and left for Canada shortly after Enoch Powell made his anti-immigrant "Rivers of Blood" speech. Since then I have happily journeyed along with Canada for the last third of its 150 years. Canada has been good to me. It has made me feel at home. It is full of promise and potential as a model country for the world. For me, Canada 150 and the marking the 150th anniversary of the country's confederacy is not just about the last 150 years. It can't be. It is about celebrating our land with its ancient peoples that have been around from time immemorial. It is about understanding the past: its accomplishments and failures, equalities and inequalities, justice and injustices, the opportunities availed and missed, the prosperity created and the still-evident poverty. It is not about quarrelling with the past 150 years, it is about debating the future 150. It is not perfect. No country is. But it is more perfect than most. Canada is my chosen home. It is not perfect. No country is. But it is more perfect than most. It is certainly less imperfect than it was in 1968, and obviously a lot more perfect than it was 150 years ago. For me, Canada 150 is about making Canada, in the years ahead, an even more perfect confederation -- a more just, egalitarian, prosperous and inclusive society. A brief look in the rear-view mirror shows that we have made a mess of indigenous peoples' lives, and it is taking us far too long to undo the damage. We need to move more quickly so that the inequality, poverty and racism indigenous peoples face is history in next 10 or 15 years -- not the next 150. By Canada 200, it would be wonderful to have had at least one -- if not more -- indigenous prime ministers. The mistreatment of the indigenous people will continue to stare us in the face until there is complete equality, reconciliation and rebuilding of a robust indigenous presence in every aspect of Canadian life. While we celebrate the huge strides on equality for women, we still have far to go. Canada is a world leader on fairness and equality for members of the LGBTQ community, but much more remains to be done. On immigration, we have come a long way from the Chinese Head Tax, the Komagata Maru, the internment of the Japanese Canadians and the persecution of the German, Ukrainian and Italian Canadians during the Second World War. We have recognized that in 1939 Canada was wrong to turn away the St. Louis from our East Coast, forcing the 907 Jews on board to return to Europe, where 245 of them would perish in concentration camps. But the lessons of that historic wrong were forgotten in our treatment of the ship full of Sri Lankan Tamils running away from terror and civil war arriving on our shores, 70 years later in 2001. As Canada continues to welcome immigrants from all over the world, we need to ensure that we assist them with integration into the economic, social and political life of the country. In the Internet age that can lead to the fragmentation of life and isolation, it is even more important that as a society we remain connected with each other in our neighbourhoods, towns and cities. We need to constantly remind ourselves of our history and remember it as we continue to move forward on the path to progress in race relations to build more connectedness and social solidarity in diversity. We need to reduce our dependence on the extraction and sale of raw natural resources. A more robust manufacturing base is a must for Canada. Creation of wealth must be enhanced along with our response to the environmental changes occurring worldwide. Poverty in Canada is a stark reality, our enduring shame. UNICEF Canada's recent report on child poverty placed Canada 26th out of 35 rich nations for child well-being, putting us "at the back of the pack." Child poverty is nothing if not poverty among the parents and the guardians of those children --simply: poverty. The wealth gap in Canada is shocking. Two billionaires control the same amount of wealth as the poorest 40 per cent Canadians; not much better than the entire world, where eight of the richest men control as much wealth as the poorest half of the world. A rich and caring country such as ours has no excuse for the degree of poverty or the huge wealth gap. Such poverty and disparity in a relatively affluent country should set the alarm bells ringing -- to not fall silent until a fairer, more equitable and poverty free society is created. Canada 150 reminds us that our pursuit of a more perfect Canada must continue. On the international front, many traditional assumptions about trade, foreign policy, international alliances and allegiances are under stress. The election of Donald Trump, his questioning of NATO's relevance and trade deals, the Brexit vote and the ascendant far-right in parts of Europe such as France are just some of the challenges that will require careful stewardship of our country and its relationships with the world. As we confront the challenges ahead, we mustn't ever the lose sight of the essence of the Canadian Project: to create the most prosperous, egalitarian, just and inclusive society, and help build a more caring and peaceful world. The Canadian Project is not perfect, at least not yet. Much remains for us to worry about, contend with and accomplish.